Yep, we went to Grand Cayman earlier this month. And it was a BLAST! I won’t drag out the details into a multi-post series like I did last year, but I do want to share them with you since trips like this are a big part of 1) being retired and 2) retiring with enough income/assets to take a nice trip. I’ll post in bullet point format breaking the trip down into various parts. Quick summary: This was the nightmare part of the vacation, followed closely by the trip home. When you live in the western United States and are traveling to the east (or in our case, even worst, the far south east part of an island in the Eastern time zone and far south of the U.S.), your travel options are generally limited. Translation: Your flights will not be at the best times and the trips will be long and/or expensive. Prior to our trip we searched for decent flights (cost and time combination). We couldn’t find any great ones. We then somehow lost our minds for long enough to book the flights we selected. We left our house at 10 p.m. on Monday, January 8, soon after we watched Clemson beat Alabama for the national championship. We drove to Denver, parked our car at offsite parking, took a shuttle to the airport, went through security, and made it to our gate. I was surprised at how many people were in the airport, going to places all over the U.S. at this terrible hour. Our flight left at 1:30 a.m. Yes, you can see where this is going. It was totally packed. I had taken a short nap Monday afternoon and am usually a great sleeper on planes, so I planned to rest during the flight. What I had not counted on was the coughing/hacking lady that sat behind us with a 30-second on, 30-second off cough. I know she probably didn’t feel well and she wanted to cough about as much as I wanted to hear it, but that didn’t help when everyone was trying to rest. Needless to say, there was almost no napping on that flight. We arrived in Charlotte at 6:30 a.m. feeling the jet lag. We found a Chick-fil-a, grabbed some grub, then went to our gate. At the gate we waited for FOUR HOURS. Yes, four hours. My wife actually stretched out and went to sleep but the rest of us simply endured the time. I had initially considered joining the American Airlines lounge so that this layover could be more comfortable. But they wanted an arm and a leg to join, so I decided that we’d simply purchase day passes. We’d spend a bit over $200 instead of $800 (or whatever it was) for something we wouldn’t use much. As we landed, I searched to find lounge locations and discovered that Charlotte did not sell day passes for their American lounges. Tip to the wise: do your searching for options at a better time than when you land. At 10:30 a.m. my mom and dad arrived on their flight from KC. We visited a bit, then boarded another plane that took off at 11:30 a.m. Since my mom was in a wheelchair (she can walk, but not far distances), we got on the plane first. We arrived in Grand Cayman around 3 p.m. We waited for everyone to disembark since my mom needed help. This put us at the very end of the customs line…but the lady who drove the wheelchair had connections. We got off the plane and she whisked us to a special customs lane ahead of the pack. We were through in a breeze, got our checked bag (more on that later), and were outside ahead of almost everyone. We took a taxi to our place at the Windsong condo, arriving by 4 pm. We stayed in unit 1 this time. Last year we were in unit 2 but they remodeled it from a 3 bedroom to a two bedroom place PLUS a separate one bedroom place. Either way, we wanted to be on the ground floor (and we were) as it had easy access to the pool. Plus we used the back door as much as the front since it was nearest the beach. If you were on the second floor you could not do this — you had to use your front door only. We were dead tired, but we unpacked a bit, then hit the beach for a short walk. Afterwards we walked to Foster’s Market (about a 10-minute walk from our place), got some supplies, came home, fixed dinner, ate, and went to bed exhausted (at 8 pm). At that time we had been up for most of 35 hours and there was no way I could have made it longer. As an overview, our average day was something like this: up at 9 a.m., eat breakfast, check my sites to be sure all was well, chat (usually outside on the patio by the pool), hit the beach by noon or 1, come home by 4, sit by the pool and chat some more, walk to the store (though sometimes we went in the morning), eat, chat/watch TV, and go to bed. Most of the days were spent at the condo and on the beach. 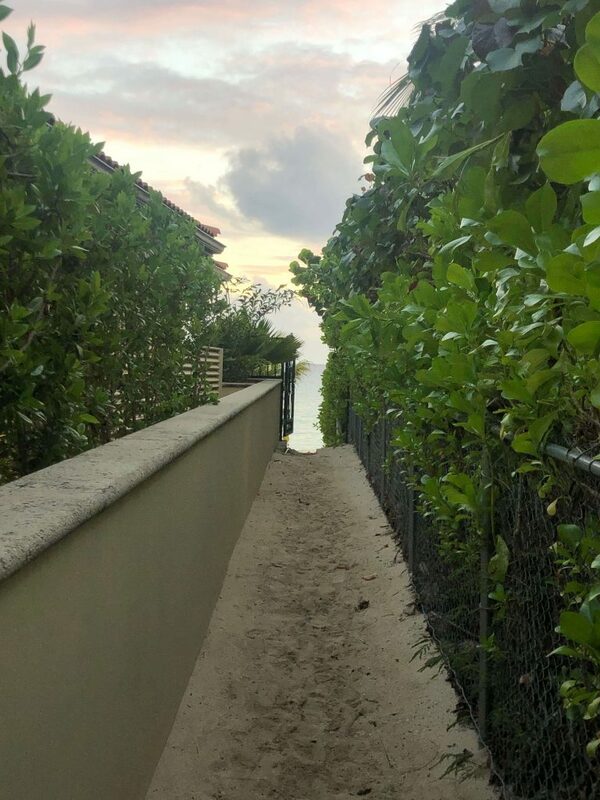 If you recall from last year, the condo was not directly on the beach, but we had to walk less than a block (a normal block — not a NYC block) through a gated, locked path to get to the beach. It was easy access and was probably fewer steps than some places on the beach. When at the condo we would mostly either snorkel or paddle board as our beach activities. We were very close to Cemetery Beach (which is on 7 Mile Beach), one of the best places on the island to snorkel. Last year I did more snorkeling and this year I did more paddle boarding. Both are great and I would often jump off the board for some snorkeling and then back on. It was tons of fun. BTW, the condo had paddle boards free for guests, which was very nice. We went to Fosters every day but Sunday (it and much of the island is closed Sundays) as my dad always “needed” something (like a cake). They have a new rule about their carts — they can’t be taken out of their lot. Last year the rule was you could drive the carts all the way home as long as you left them on the main drag to be picked up. You can’t do that any longer, which we found out when we tried to drive the cart out of the lot and ran into a red line that made the cart seize up. It was then we recognized the red boot on one wheel, asked what was up, and was told of the new policy. It wasn’t that big of a deal except when we bought a lot. My daughter and dad played a lot of Aggravation, our family’s board game of choice. They always play for money. She won $9 from him during the stay and was quite happy with the haul. The weather was good. There wasn’t a day we were hampered by clouds or rain. On many days it would start by raining or being cloudy but would then blow over and be amazing. 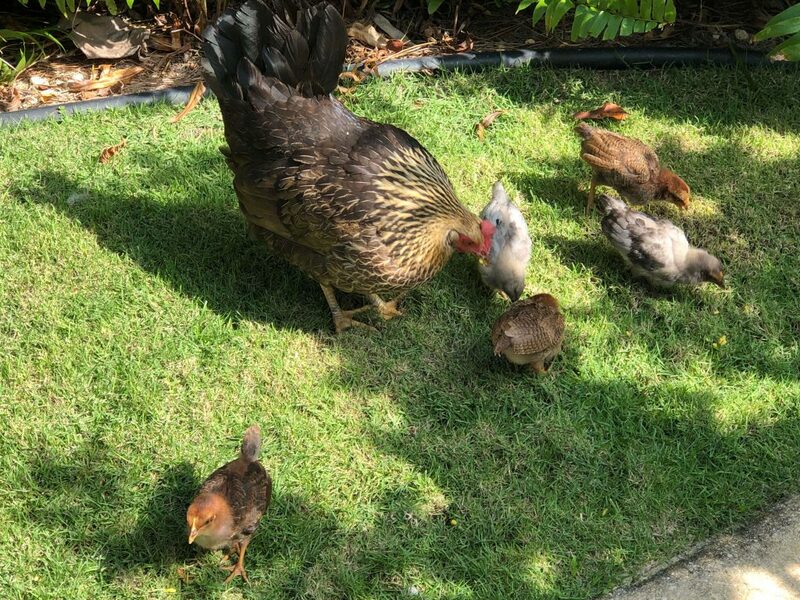 On Thursday, the chickens showed up — a hen and five chicks. There are chickens all over the island (I was awakened almost every day by a rooster) and these seemed to like us. They liked us even better when we fed them, which we did once or twice every day. During the Cayman vacations I allow myself to eat sweets, the only time of the year I do this. So I filled myself with cake, cookies, candy, etc., though not as much as I had in past years. It wasn’t all lounging around the condo/beach. We like vacations with a mix of relaxation and some activity, so this section will highlight some off-beach activities. 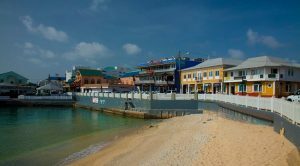 On Friday January 11 we went into George Town (the main city). We took the bus (we did not rent a car again this year, see last year’s post for details why) which was still $2.50 a person each way and stopped for passengers like a cab does (very nice). We did a bit of souvenir shopping (the kids each got something) and had ice cream (the Dairy Queen downtown actually has very reasonable prices) before returning home. On Sunday, January 13 we again (like last year) chartered a boat with the Cayman Snorkel Company. It started out rainy and we were afraid our day would be washed out but once we got into the North Sound water, the sun came out. Our captain, Jason, said that’s just how the weather is. “It can be raining in my front yard and sunny in my back yard” were his exact words. On the way out we fished/trolled and got something on the line. My son reeled in a good-sized (and gruesome looking) barracuda. We got a picture with it then release him back into the water. Then we went snorkeling at the same place we did last year (awesome) and where the eel lived in the coral. But this time he came out and swam towards us, something that was pretty freaky. He turned away quickly though and then went back into hiding. After that we went to another snorkeling spot and fished too. We then headed home and were back by 6 pm. It was once again a great time and one of our favorite parts of the trip. We will do it again if we go back next year. And Jason will be offering tubing by then, so we’ll probably do that too. On Wednesday, January 16, four of us (son, daughter, dad, and me) took the bus to Red Sail Sports near the Kimpton. We made plans to ride Waverunners but since they needed two more for all of us to go together, we had to wait an hour. We went to the bar right beside Red Sail (it was on the beach and open to the air) and had some drinks (no alcohol) to wait out the delay. We then got on the Waverunners and proceeded to have a BLAST for 30 minutes, riding all over the ocean. When we were done we ate at the Kimpton’s outside restaurant on the beach (very good) then headed home by bus. We hit a couple other restaurants during our time there. One night three of us went to Heritage Kitchen, got food for the whole group, and brought it back to eat. They had a chicken meal on the menu but were out of it, so three of us ate fish from Heritage Kitchen and the three that wanted the chicken dish ate sandwiches from the Subway nearby. The ones who had the fish loved it, but I could tell I would not have liked it. My fish needs to be fried, breaded, seasoned, or sauced, and this didn’t seem to fit the bill. The “big” restaurant find was Chicken Chicken. We went there (by bus) on Tuesday, January 15 and had roasted chicken (amazing spices), cornbread, and garlic mashed potatoes. It was so good that the next night my dad wanted it again. So he and my daughter took the bus, picked it up, and brought the food back to the condo. It was not only great but very affordable — costing something like $60 for six of us. Of course the vacation was over way too soon and we had to head back home. We left our condo at 1:15 p.m. on the 17th, taking a taxi to the airport. The airport was under construction/remodeling last year and now is very nice and modern. That said, it was packed to the gills which didn’t make for a great waiting experience. Our plane left at 4 p.m. We got on early again as my mom needed help. We arrived in Charlotte at 7 p.m. and customs was so much better than in Miami (last year). We had special treatment as we were with my mom, but even if we had not, the lines were so much shorter than they were last year. We made it to our gates (our flights had joining gates and left within 30 minutes of each other), then got some fast food to tide us over. My mom and dad left for KC at 10 p.m. and at 10:30 p.m. we were on a flight to Denver. We arrived in Denver at 12:15 a.m. our time (2:15 a.m. Cayman time). We caught a shuttle to our car and drove home. We were in bed by 2:30 a.m. our time, 4:30 a.m. Cayman time. Not as bad as the flights there but we had still been up for 19 hours. I found out after we got back that Millionaire 18 had been in Grand Cayman several of the days we were there (the end of his trip overlapped with the beginning of ours). He stayed a couple blocks away and we probably walked/swam right by each other at the store, on the beach, or in the water. What a small world! This year one nice thing about the trip was that we were familiar with the island, where we were staying, how things worked, etc. It took out a lot of the anxiousness that you can sometimes have with the unknown. This might be the last trip all six of us take together. My mom and dad are hitting the road in their RV next year and the kids are starting their careers soon, so who knows what will happen. It may be just me and my wife going next time, which would be great in a different way. We aren’t sure what we’re going to do next year but ideas we’ve discussed are: 1) go back to Grand Cayman (Cayman Airlines opens up a new Denver to Grand Cayman direct route this March which takes 4.5 hours to get there — sooooooooo much better than the flights we had this year), 2) visit Hawaii (we haven’t been as a couple — my wife went once with her mom), 3) take a cruise (we’ve been on three), maybe over Christmas and/or New Years, or 4) hit a different Caribbean island (probably a U.S. Virgin island, a British Virgin Island, or St. Martin). As I said, we took far fewer pictures this year and since we don’t publish photos of the family, that limits my choices. But the pics below do give a good sense of the various places I’ve talked about above. Someone decided to get all zen on Seven Mile Beach. Sunset on Seven Mile Beach close to where we stayed. 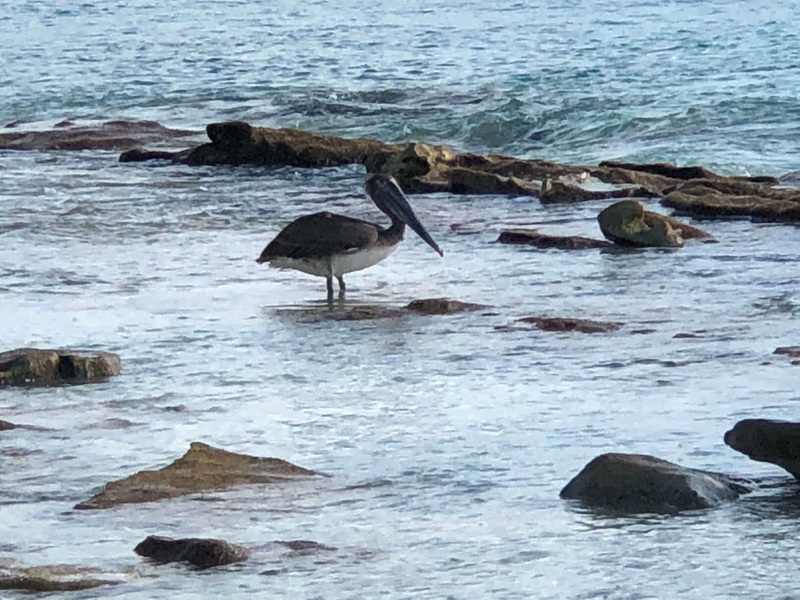 This bird on Seven Mile Beach would wait for small fish to wash over the rocks and get trapped — then he would feast! Our path to the beach. One of the few starfish we saw at Starfish Point. The Grand Cayman had not been on my radar until now so thank you for the nice review. The biggest takeaway I got, and it was a brilliant idea, was packing 50 lbs of food and just paying $35 for an extra checked bag. That really was clever and something I know I would never have even come up with on my own. I hate paying checked bag fees like the next person, but here it makes perfect sense as in the big picture you come out far ahead. Will definitely check out Grand Cayman as a next destination. We Just got back from a vacation in Aruba and had a great time! We stayed at the Renaissance Aruba Resort & Casino which had it’s own private island. The seafood is fantastic – especially madam jennettes. The island is super clean, owned by Netherlands and people are happy and hospitable! We went to Aruba 20 years ago and loved it. I’m sure a ton has changed there in the meantime. Think about staying longer than a week next time! The economies of scale work in your favor on airfare the longer you stay. Plus, when we rent an Airbnb condo for a month (28 days/4 wks) in some places, we get up to a 50% discount! May not work in Cayman, but there are lots and lots of beautiful islands in the Caribbean! So nice to read about a multigenerational vacation; such great memories you are making! I want to — but my wife is skeptical (not sure she can find enough to do). How do you get discounts like that? Do you contact the host directly and ask for a better rate for staying longer? Sometimes you can see the discounts on the Airbnb website or app if you scroll down to “Additional Prices”. We got an auto 50% off on a house in Chapala MX for a month rental (so we are staying 2 months for price of one) & have received around 20% for some weekly rentals automatically. Not always, just depends on listing. It’s less hassle for owners for longer term rentals. We are perpetual travelers (starting Year 4 now), and have never asked for additional discounts when we get discounts like these. Maybe we should? I guess we end up seeing them first in our search based on price, as the discount is applied when we put in a full week and full 28 day rental to compare. We use public transport wherever we stay, like you did. In my opinion, staying longer gives you a better feel for what it’s like to live in a place, and the stress in getting there, unpacking and packing up again takes up most of a week, based on when we vacationed while working. We are in Cozumel now for the month of January, and most folks we met here said if they stayed 2 weeks they started relaxing in the middlle, but not for a week. YMMV, of course! We travel to beach and non-beach places around the world, and love our 1 month stays especially. Many are 1 or 2 week bigger city stays, with lots and lots to keep us busy, or lazy if we want. But we always add on an easy island to relax when possible. Seems like beach places are best for your extended family right now. I would just suggest you look at maybe 2 weeks next time to see how different it feels. We went from 1 wk to 10 days to 2 weeks twice a year while working, and 2 weeks was a game changer in actually relaxing and getting into full vacation mode somewhere in the middle. P.S. Love Cayman and know Cemetary Beach. Beautiful place! One question: Do you find a difference between VRBO, AirBnB, and Homeaway as far as places offered and discounts available? Airbnb seems to have the most listings worldwide and straightforward payment options using cc not charged until you check in and report no probs. Homeaway and vrbo have same owners now, I believe. I occasionally check them also, but usually book Airbnb. I think some vrbo/homeaway also list lower/discounted monthly rates. By the way, love your blog, so helpful and inspiring! Your Millionaire and scale series is addictive! Thanks! And thanks for the info — appreciate it! Glad you had another great trip! I enjoy reading your vacation posts. I vote you go to Hawaii next time because I think the flight would be much easier. Not sure what island(s) you’ve been to previously but wanted to suggest Maui- specifically Napili Bay. It has a small beach cove with lots of affordable condos right off the beach. It’s a nice place to paddle board and snorkel. Kapalua Beach is the next cove over and it has great snorkeling. Hope you’ll check it out and look forward to reading about your next trip whatever you choose. great post and pictures – thanks for sharing. i love it when something different is posted like travel instead of money all the time! I love your idea of taking 50 pounds of food with you. Did you leave the “old suitcase” behind so that you did not have to pay for a return trip (or maybe you nested bags)? We just got back from a 2 week trip to Barbados and I really loved it. Friendly people, great beaches, lots of tourist activities. I’ve always done week long vacations before and this one let me relax a lot more, so future vacations will be 2 weeks long, probably. Hawaii is very nice also. 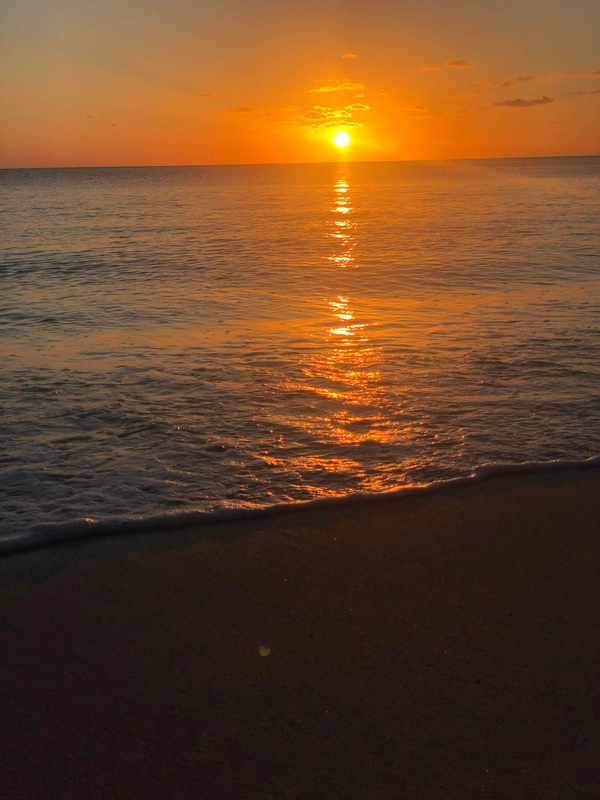 From my experience, I would rate Maui as my favorite, followed by Barbados, Tresure Island (Florida – Tampa Bay Area), and then Oahu. We’ve been to Barbados a couple times — on a cruise, not to stay — and loved it. I always wondered about safety on the island. It seemed fine, but also had signs of some not-so-great areas. 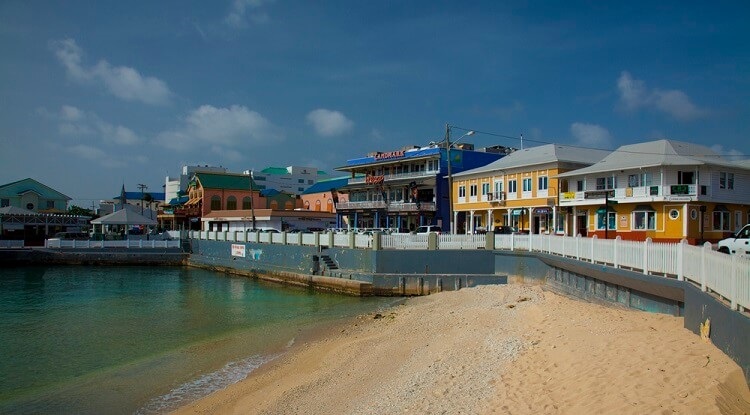 One thing we love about Grand Cayman is how safe it is. LOL- I had no idea you could pack a suitcase full of dry foods! Is that allowed on all trips? We’re going to the Bahamas and I know the prices of food/snacks is crazy high on our resort. This would be a great idea…. too bad we can’t pack booze. Friends told us to take a trip into the town to go shopping for snacks/booze to save lots of money. I would advise anyone thinking of doing the same to Google the requirements of the country they are going to, just to be sure what’s allowed and what’s not. That’s a great tip about carrying a separate suitcase of food. My kids are fussy eaters so I always have them bring “snacks” in their carry-on and suitcases, like granola bars, kind bars, croissants, bagels, apples, fruit roll ups, but never a full suitcase of food. When we go on a longer adventure or have more people, I’m sure it will make sense to bring more food. I’m impressed you only eat sweets one week/year! We are going back to Cayman for a week this month, and I can’t wait! Love this! I am such a sucker for the beach! My husband and I skipped the fancy wedding and actually had an affordable destination wedding in Jamaica. I love a good beach trip to the Caribbean and we’ve been back once but I’d love to go to Grand Cayman. Maldives would be a dream come true. Guess I better get to work ? Thank you for sharing details on your trip. Since we are retired, traveling is so much more fun and more time can be spent in each city. I’m not as good as Lisa is above as a perpetual traveler, but our friends think we travel all the time. Last year was 89 nights away from home. Your ideas on saving money in Grand Cayman is helpful. We are hiking in Death Valley next week, gorgeous area in a desolate way. Costa Rica at an luxury all inclusive resort is scheduled for our 30th wedding anniversary. We don’t drink but we do like food, soft drinks and non motorized water activities, but a splurge. Currently scheduling 30 days on the Big Island of HI. We go to one of the Hawaiian islands every year. Maui in 2017 was nice and the Westin is a good choice for their offer and then find a condo for additional time. We spent 16 days in Maui that year. Maui and the Big Island are so different in landscape and activities. I like the Big Island for the snorkeling and volcano hiking. So my wife grew up going to Aruba 2-3 times a year with her grandparents – they just happened to have a place that has been in the family for like 50 years. Anyways, the flight was about 5 hours from Miami. Her grandmother would freeze meat – rock solid – and pack it in a bag with dry foods. When they got to the hours in Aruba, it was just about thawed out and ready to cook! Not sure if that is legal, but I did throw some ribeyes in the bag the last time we went – worked great. I’m new to the ESIMoney world and I’m digging into the treasure trove of content on your site. 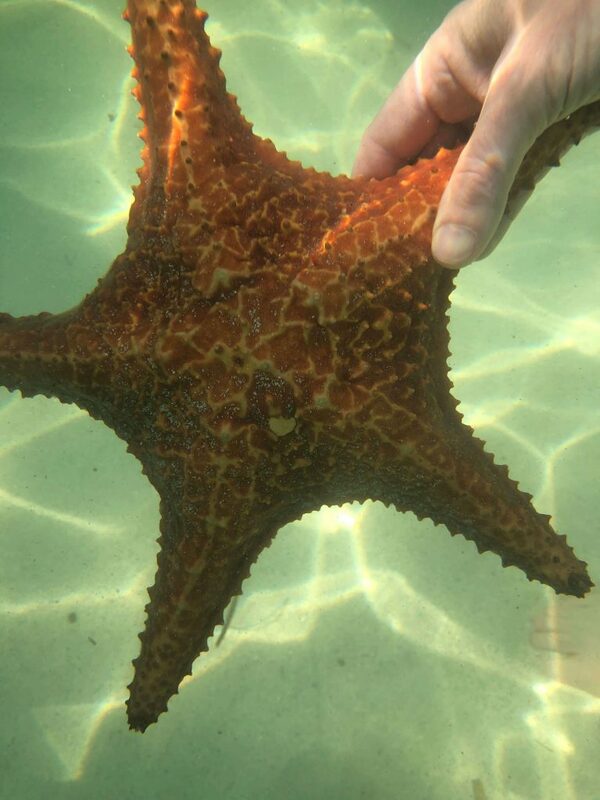 I was thrilled to come across this post and to hear you had such a wonderful time on Grand Cayman during both trips. I was born here in the Cayman Islands, I was raised here, and I currently live here on Grand Cayman. 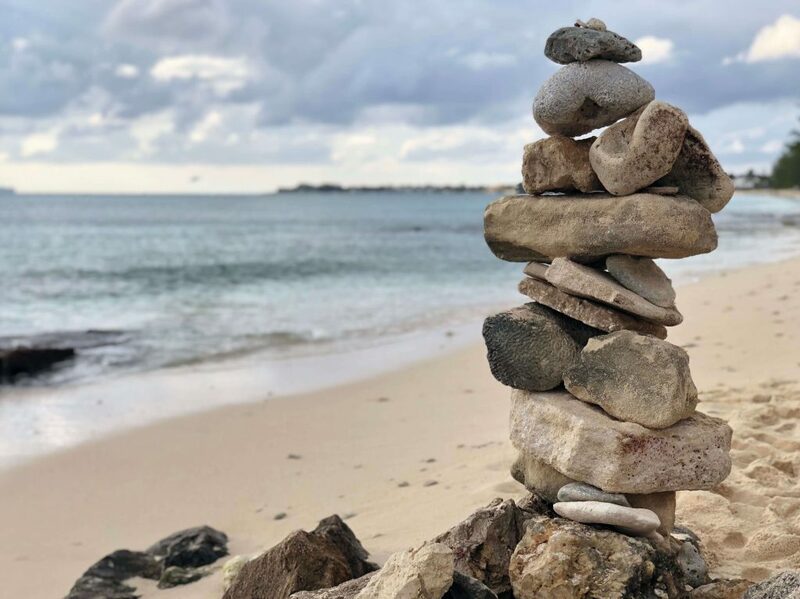 Thanks for sharing your experience – in Grand Cayman and your path to wealth. I hope you’re able to return soon. That’s so awesome! I love your country!! !